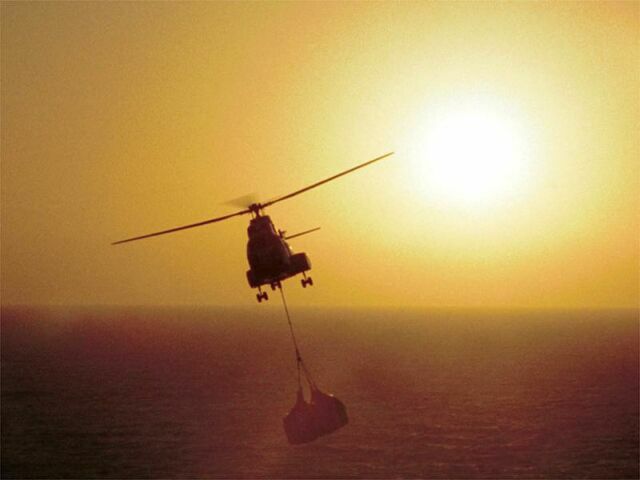 The Arabian Gulf, 27 February 2001 — A CH-46D Sea Knight helicopter transfers stores between USNS Kanawha (T-AO 96) and USS Harry S. Truman (CVN 75) during a replenishment at sea in the Arabian Gulf. Truman is operating in the Gulf in support of Operation Southern Watch. U.S. Navy photo by Photographer's Mate 3rd Class Donna J. Doyle.